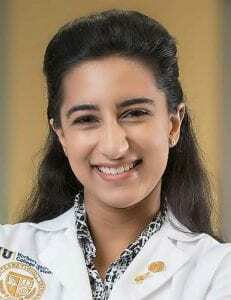 Amara is a third year medical student at FIU Herbert Wertheim College of Medicine in Miami, FL. She received a B.A. in Economics and a minor in International Development and Humanitarian Assistance from the University of Florida, and studied development economics at Korea University. In 2015, she served as an AmeriCorps member with the American Red Cross, responding to disasters across Florida, resituating survivors of house fires and floods, and teaching First Aid and CPR classes. She worked with the UF Health in Africa Working Group to submit a paper to the World Health Organization on mental health in Liberia following the Ebola outbreak in 2014. During her undergraduate years, Amara was a passionate advocate for socially marginalized groups and was an ambassador at her university’s office of Multicultural and Diversity Affairs. At her medical school, teaches healthcare providers how to recognize victims of trafficking in conjunction with AMWA PATH, and launched an initiative as AMWA Region 4 Director to combat human trafficking throughout the Southeast United States.